It was raining nonstop in Chikkamagaluru, my hometown, not too far from Agumbe, one of the wettest places in India. I was on leave, preparing for a monsoon adventure biking trip in the Western Ghats. A day before starting the trip, my mother and I were planting teak and coffee saplings at our farm, freshly washed by the rainwater. My mother thanked the gods for blessing us with good rains. I was farming and listening to the BBC podcast, and I told her that the same rains have sealed 13 people alive deep inside a cave in Thailand. I chose a place between two pineapple plants—a vantage point to the roads leading to the cave, which was a few hundred metres away. This was my bivouac for the next two days. When I got a call from office to rush immediately to the Tham Luang cave, my mother suggested not to remove my rubber rain boots and tucked in my raincoat and clothes into the saddle bag of my motorcycle. I never imagined that my adventure would change its direction—that in the next 18 hours, I will be near the Thailand-Myanmar border, the epicentre of the multinational rescue operation in the flooded cave network. For me, acclimatisation was easy, as the hilly terrain and rainy weather of Mae Sai, the town near Tham Luang cave, felt like our very own Western Ghats. Most passengers in the early morning flight from Bangkok to Chiang Rai, the airport nearest to Tham Luang, were like me—international press persons headed towards the cave site with heavy camera bags and rainproof boots and clothing. Four boys had already been rescued by the time I reached the place where television reporters were broadcasting live in almost all languages in the world! My first mission was to find the way to the cave site in the pouring rains. 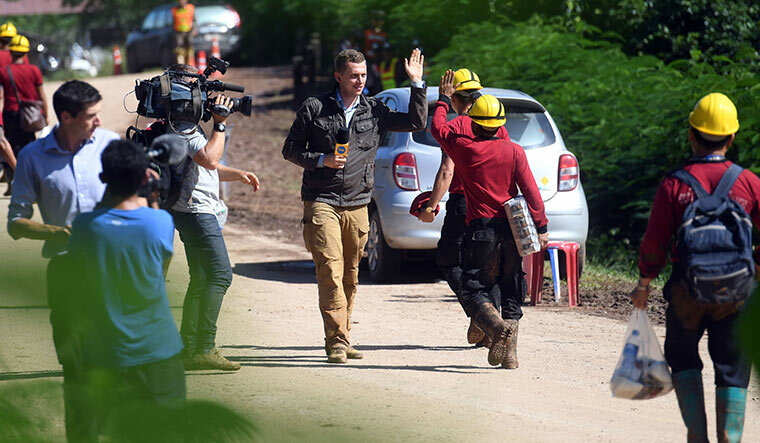 All media persons were stationed at a government office in Mae Sai, overlooking the misty mountains—they were asked to vacate the cave site, hours before the rescue operations started on July 8. Ahead of me were cornfields, filled with slushy water. No journalist was going beyond these fields. With a 15kg backpack, I started walking through the fields, which led me to a stream. My rain boots helped me wade through the stream, and I approached a small lake. Orange emergency vehicles were parked next to the lake and kept on standby. But there was no sign of the cave. The muddy roads had turned into a quagmire because of vehicular movement. I walked for a kilometre through hilly roads, and found a police check-post and a sloppy pineapple field. A few journalists had set up video cameras inside the thorny pineapple bush. This was the last point media persons could go, and I was fine with it as I have been witness to many events where an overcrowded, news-hungry media obstructed rescue operations. I chose a place between two pineapple plants—a vantage point to the roads leading to the cave, which was a few hundred metres away. This was my bivouac for the next two days, even as the weather kept changing within minutes from heavy rains to scorching heat, from a pleasant breeze to sultry winds. And, all I had was a raincoat and a Thai palm hat for an umbrella. In between getting visuals of the ambulances and rescue teams that vanished beyond the curve between the mountains and later returned with the rescued boys, I had a lot of time to think. The mountains before me were covered in lush green vegetation, giving a peek of the mountain’s limestone surface in some places. And that got me thinking about the cave structure. It took me back to Malaysia, where I went spelunking at the Dark Cave in the Batu Caves, north of Kuala Lumpur, in April 2017. Also a limestone cave, the Dark Cave is adjacent to the Lord Murugan cave temple, which attracts devotees and tourists. At the Temple Cave, the open roof allows rain and natural light to come in. Still, you could get claustrophobic. On the other hand, you can enter the Dark Cave only with the help of helmet-mounted lights. And, you would have millipedes, cockroaches, bats and the rare trapdoor spider for company. Then there are spooky stalagmite and stalactite formations, but the darkness, which could be disorienting and could cause panic, might hide them from plain sight. Most visitors hurry through the Dark Cave tour to get back to light. The experience of getting caught inside a dark and confined area creates panic. I have seen friends panic after getting stuck in an elevator for ten minutes. Another friend stopped the car just before the entrance of a highway tunnel that was less than a kilometre long. Imagine the situation of these boys who waited for nearly two weeks to be rescued. For them, even days were nights inside the dark and stuffy cave. This incident reminded me of many children in India who have died after falling into borewells and miners who were trapped in Chile in 2010. I wonder why this group of young footballers from a remote corner of Thailand attracted the world’s attention. Was it because of the ongoing FIFA World Cup? Or, was it because their story gave hope? Whatever be the reason, the whole world united in an unprecedented way to rescue the children. In these times of conflict, the incident is a lesson in how compassion beyond borders can make earth a better place to live on.